Electronic Arts was voted and named the worst overall company (not video game company mind you) in the United States this year for the second year in a row. An amazing feat only made even more impressive by today's surprise and unprofessional rant from a Senior Software Engineer and Architect, Bob Summerwill at EA spewing Wii U and Nintendo hate all over this Twitter page. I'm sure that EA will indeed fire this individual for making these comments, not because they disagree with him but because the Press and gaming Media will make enough about it to force their hand. I've heard worse from fanboys of the other companies but this was in poor taste from someone who is higher up in a big company. He is definitely entitled to his opinion but this one went a little over board. Electronic Arts was once a decent company back in the 1990's, during that time game development was more on an equal ground with most just trying their best to make the best games possible. Now, in 2013 it has become only about money to a lot of companies and the best example of this of course is EA. Soulless, selfish and unreasonable. It's sad about what happened to this company over the years but it's also nice that they are getting quite a backlash from the community and ever since that time of being named "worst company" they have laid off a lot of employees to save some face. EA has some great properties that they publish from great developers, it's just sad that those developers don't have a say about what system they can release games for (Crytek wanted to release Crysis 3 on Wii U but EA said no). EA has a recent history of rushing developers to finish games too quick to make more money due to scheduling. Mass Effect 3 was rushed to release, sacrificing the ending of the game, only to be "forced" by the community to go back and fix/finish it. Sim City 5 was an utter disaster with it's "always online" DRM that didn't work most of the time the first week of release. Sim City 5 also had car advertisements in it's first DLC package......which brings up another point about EA: They over charge for games that are not finished, but try to force gamers to purchase DLC for the game at a higher than normal cost later. The Wii U will miss out on most notably Battlefield 4 that is developed by DICE, but thankfully with a game like Battlefield the best experience is nearly always on PC. Nintendo is going to continue doing what they have always been doing, which is focus on making great games that people want to buy. The Wii U has sold nearly 4 million systems in 6 months, all without a true system selling game; it's had some very good games but nothing that can be considered much beyond what the current consoles are doing. 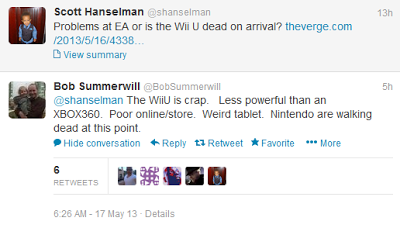 The Wii U is going to be around for Nintendo's usual 5 year run and is just barley getting started. Nintendo has also admitted that they are behind in development on some Wii U titles that should have been released already and they are taking responsibility to that mistake. Taking it all into consideration, Nintendo still does not need Electronic Arts to be successful and both companies know this.